Divide a square into non-congruent rectangles. If all the sides are integers, what is the smallest possible difference in area between the largest and smallest rectangles? This is known as the Mondrian art problem. This Demonstration shows optimal solutions up to size 57 and best known solutions up to 900. Up to the square of side 100, check the "analysis" box to see the possible improvements. If all of those possibilities can be checked in a packing program without a new solution turning up, the given solution is optimal. Can the defect be 0? If the rectangles do not have integer sides, there are many solutions, known as Blanche dissections. Whether there is an integer Blanche dissection is an unsolved question. The defect for square might be bounded above by . The quality of a solution is the favorable distance from this upper bound [6,9]. In the variant, a rectangle can be repeated if it has a different orientation. It is is a tiling where no rectangle has a direct translation to another rectangle. The upper bound seems to be . Solutions up to size 45 are optimal. 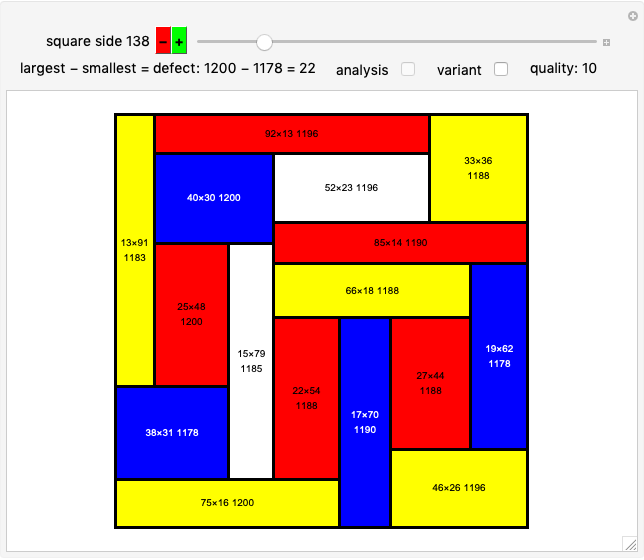 The defect 8 solution for the 18×18 square was found by Bruce Norskog. Solutions for cases 14×14, 16×16, 23×23-57×57 were found by R. Gerbicz . Many solutions also verified by Hannes Bassen. G. Hamilton. "Mondrian Art Puzzles." mathpickle. (Nov 23, 2016) mathpickle.com/project/mondrian-art-puzzles. E. Pegg Jr. "Blanche Dissections." Wolfram Community. (Nov 23, 2016) community.wolfram.com/groups/-/m/t/903043. 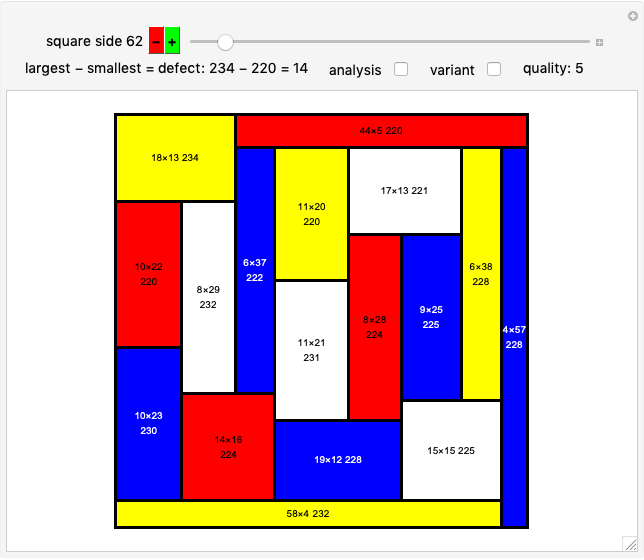 "Tiling a Square with Rectangles." MathOverflow. (Nov 23, 2016) mathoverflow.net/questions/220567/tiling-a-square-with-rectangles. B. Haran. "Mondrian Art Puzzle." bradyharanblog.com. (Nov 23, 2016) www.bradyharanblog.com/blog/mondrian-art-puzzle. Numberphile (2016). Mondrian Puzzle—Numberphile" [video]. Retrieved November 23, 2016, from www.youtube.com/watch?v=49KvZrioFB0. "Mondrian Art Problem Upper Bound for defect." MathOverflow. 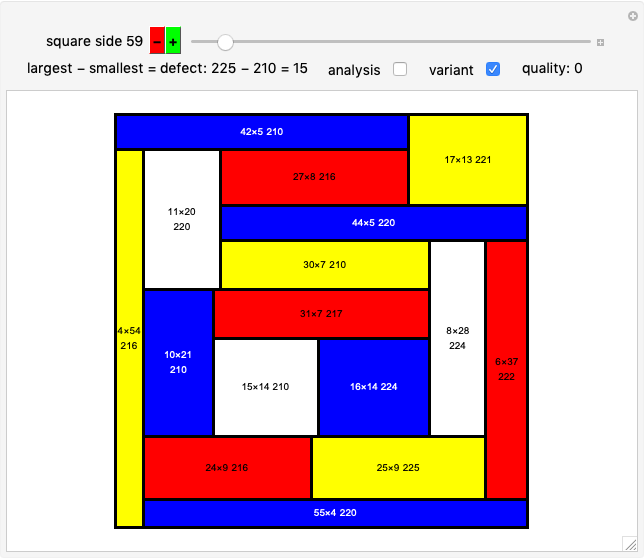 (Dec 8, 2016) math.stackexchange.com/questions/2041189/mondrian-art-problem-upper-bound-for-defect. Ed Pegg Jr "Mondrian Art Problem"